There’s a scene in the beginning of Young Frankenstein where a young medical student stops Gene Wilder’s Dr. Frederick Frankenstein (that’s Franken-steen) mid-lecture to question him about the work of his grandfather, the Modern Prometheus himself, Victor Frankenstein. Immediately upon hearing the question, there’s a spark of rage in Frederick’s eyes, a hint of the madness that is his family legacy, but he keeps his cool (just barely) and, with forced calm, attempts to redirect the lecture by hissing “My grandfather was a very sick man” through practically gritted teeth. Pushed further by the student, he eventually loses himself in fury. With that, he accidentally sinks the scalpel into his leg and, with a forced and fragile tranquility, dismisses the class. 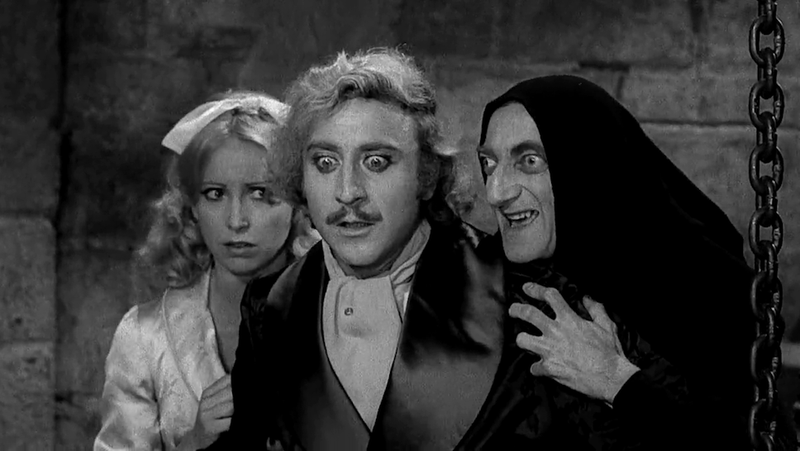 On Monday, August 29, 2016, Gene Wilder—star of Young Frankenstein, Willy Wonka and the Chocolate Factory, Silver Streak, and so many great films-died from complications of Alzheimer’s disease at the age of 83. His comedic work will live on in the pantheon of great performances—both because it’s funny enough to bring tears to your eyes and because Wilder—a man who, throughout his career, seamlessly wove together sadness and silliness and anger and frivolity—was one of the most talented actors to ever grace the screen. In a lesser actor’s hands, Dr. Frederick Frankenstein could have been a classic straight man—the voice of reason amidst a circus of mad characters—but Wilder, like a bolt of lightning to a Transylvanian tower, brought manic life to the role. During a screening celebrating Young Frankenstein’s 40th anniversary, Leonard Matlin asked Cloris Leachman to name her favorite scene in the movie. While Wilder was cast in several amazing parts that were surely funny from the jump (considering the work of screenwriters like Mel Brooks and Richard Pryor), it always fell to him to bring the spark, to set his fellow actors on edge, to do what wasn’t expected of him and make the movie better. These skills were what made him trustworthy to directors like Brooks who knew that they could give him something simple and he’d turn it into something brilliant. Wilder’s most popular role was likely that of Willy Wonka in 1971's Willy Wonka and the Chocolate Factory. His portrayal of the madcap candyman was unique in that he managed to capture what’s often missing in film adaptations of Charlie and the Chocolate Factory author Roald Dahl’s work: These stories, though fantastical and fun, are also terribly frightening, especially to children. Wilder’s Willy Wonka wasn’t just kooky and eccentric—he was also menacing. Throughout his career, which spanned over half a century, Wilder was always bringing something unexpected to the table—whether it was the creepiness of Willy Wonka, the fury of Frederick Frankenstein, the bone-deep sorrow of Jim the Waco Kid in Blazing Saddles, or reluctance of a producer launching a Nazi musical on Broadway in The Producers. Wilder, no matter the role, always went deeper than you thought he could. The decision to wait until this time to disclose his condition wasn’t vanity, but more so that the countless young children that would smile or call out to him ‘there’s Willy Wonka,’ would not have to be then exposed to an adult referencing illness or trouble and causing delight to travel to worry, disappointment or confusion. He simply couldn’t bear the idea of one less smile in the world. Until his dying day, Wilder projected light and humor with an underlying sadness—though, from nephew’s point of view—he never let his illness drag him down completely. Unfortunately for the living, Frederick Frankenstein was initially right: You can’t reanimate the dead or bring back what is lost. We’re lucky, though, that Wilder left behind an oeuvre so full and all encompassing that we can revisit it—and find something new—whenever we choose.